Stock # A12546, 6.0L DI V8 Turbo-Diesel Power Stroke Engine, Automatic, 154375 mi. 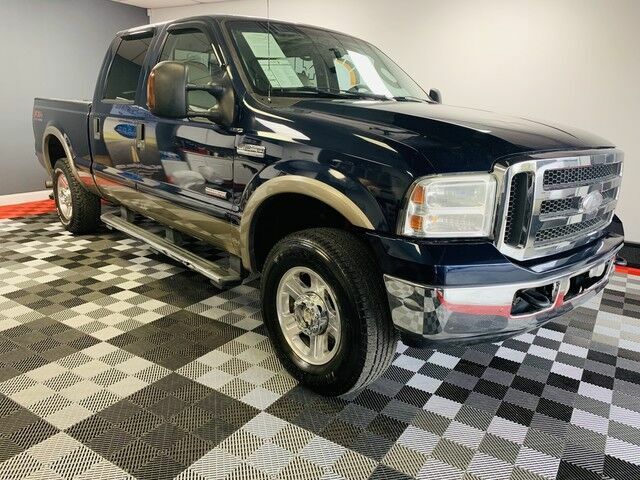 Check out this gently-used 2005 Ford Super Duty F-250 we recently got in. This Ford includes: ADJUSTABLE GAS Adjustable Pedals TORQSHIFT 5-SPEED AUTOMATIC TRANSMISSION W/OD 5-Speed A/T Transmission Overdrive Switch A/T CLASS V TRAILER HITCH RECEIVER Tow Hitch CHROME TUBULAR CAB STEPS Running Boards/Side Steps PWR SLIDING REAR WINDOW Sliding Rear Window REVERSE VEHICLE AID SENSOR Rear Parking Aid PREMIUM ELECTRONIC AM/FM STEREO RADIO W/IN-DASH 6-DISC CD CHANGER CD Player AM/FM Stereo CD Changer TOWCOMMAND SYSTEM Integrated Turn Signal Mirrors Power Mirror(s) Heated Mirrors HEAVY SERVICE SUSPENSION PKG LEATHER FRONT LUXURY CAPTAINS CHAIRS Leather Seats Bucket Seats STABILIZER PKG FX4 OFF-ROAD PKG LOWER ACCENT TWO-TONE PAINT HEATED DRIVER Heated Front Seat(s) LARIAT LUXURY PKG Steering Wheel Audio Controls A/C Climate Control Auto-Dimming Rearview Mirror Woodgrain Interior Trim Trip Computer ELECTRIC SHIFT-ON-THE-FLY TRANSFER CASE (4) UPFITTER SWITCHES 6.0L DI V8 TURBO-DIESEL "POWER STROKE" ENGINE Diesel Fuel 8 Cylinder Engine Turbocharged *Note - For third party subscriptions or services, please contact the dealer for more information. * Drive home in your new pre-owned vehicle with the knowledge you're fully backed by the CARFAX Buyback Guarantee. Taking the road less traveled has never been more fun than with this 4WD. With improved performance, mileage and acceleration, this 2005 4WD Ford Super Duty F-250 Lariat is king of the off-road. A Ford with as few miles as this one is a rare find. This Super Duty F-250 Lariat was gently driven and it shows. Added comfort with contemporary style is the leather interior to heighten the quality and craftsmanship for the Ford Super Duty F-250 Class defining, one-of-a-kind options are the standard with this Ford Super Duty F-250 plus much, much more. If you're looking for world-class speed, acceleration, cornering and handling, don't blink because you'll miss this truly amazing automobile. This Ford Super Duty F-250 Lariat is in great condition both inside and out. No abnormal "wear and tear".